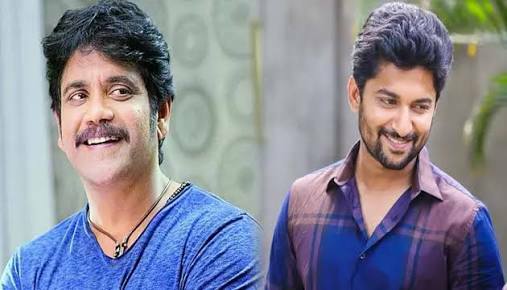 King Nagarjuna - Natural Star Nani's Multi-Starrer Produced by Mega Producer C.Aswani Dutt in his prestigious banner 'Vyjayanthi Movies', Directed by T. Sri Ram Aditya is undergoing its regular shoot since Ugadi (March 18). Currently unit is shooting some scenes in Metro Train at Miyapur Metro Station, Hyderabad. This is the first film to shoot in a recently started Metro Train at Hyderabad. Scenes involving Nani, Rashmika Mandanna and Sampoornesh Babu were canned in the Metro train. With these scenes film has completed its first schedule.